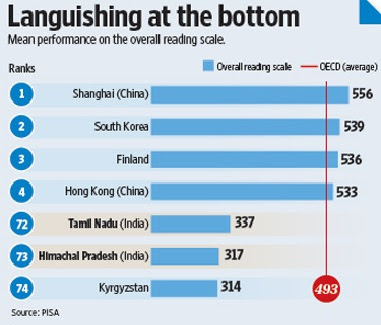 Indian students rank near the bottom on PISA, a global test of learning standards conducted in 74 nations this year. TIMSS, another standardized international test, produced similar results earlier in 2003. This is the first time that Indian students participated in PISA. 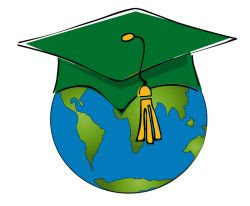 Students from Himachal Pradesh and Tamil Nadu took the Program for International Student Assessment (PISA) test, coordinated by the Paris-based Organization for Economic Co-operation and Development (OECD). Prior to this participation, students from Indian states of Orissa and Rajasthan took a similar test called Trends in International Mathematics and Science Study (TIMSS) in 2003. Economic gap between East and West Pakistan in 1960s is often cited as a key reason for the secessionist movement led by Shaikh Mujib's Awami League and the creation of Bangladesh in 1971. This disparity has grown over the last 40 years, and the per capita income in Pakistan now stands at 1.7 times Bangladesh's in 2011, slightly higher than 1.6 as it was in 1971. Forty years after the Fall of Dhaka and the creation of Bangladesh on Dec 16, 1971, there's still much talk about it. The Daily Star, a Bangladeshi newspaper, has published a piece on the subject by Akbar Ali Khan marking the 40th anniversary of Bangladeshi independence. In his Op ED, Mr. Khan argues that "political independence provided much more conducive environment for growth in Bangladesh than united Pakistan. Though economic growth in East Pakistan was revived during Ayub Khan's so-called decade of reforms, growth rate in erstwhile East Pakistan was much lower than that of West Pakistan". Pakistani-American Shahid Khan made history this week by becoming the first minority owner of a National Football League team. 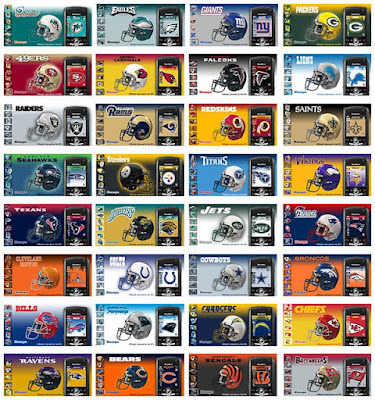 All 31 other owners of NFL teams are white. The deal to purchase Jacksonville Jaguar is for an estimated $760 million and the ownership transfer will be complete Jan. 4, 2012, according to Associated Press. Earlier, Khan agreed in February 2010 to buy a controlling interest in the St. Louis Rams before billionaire Stan Kroenke exercised an option to purchase the 60 percent of the club he didn’t own. 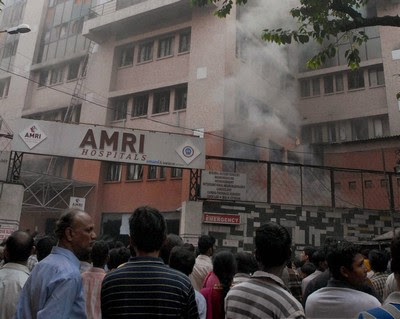 A deadly hospital fire claiming 91 patients' lives in India last week is raising serious concerns about the safety of foreigners being wooed by the nation's growing medical tourism industry. India "Time of Reckoning" as its Economy "Explodes"
For at least two years in a row, BRIC has, in the words of SGS's Albert Edwards, stood for Bloody Ridiculous Investment Concept, not an acronym for populous emerging markets of Brazil, Russia, India and China as Goldman Sachs' Jim O'Neill saw it ten years ago. In fact, O'Neill has himself expressed disappointment in India, one of the BRICs, a designation that has boosted foreign investment in India and helped accelerate its economic growth since 2001. "All four countries have become bigger (economies) than I said they were going to be, even Russia. 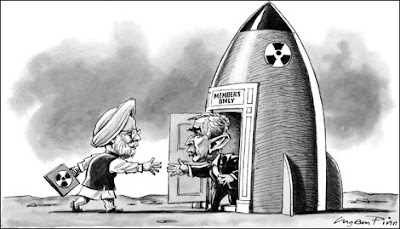 However there are important structural issues about all four and as we go into the 10-year anniversary, in some ways India is the most disappointing," said O'Neill as quoted by Reuters. Asif Farooqui is making millions of dollars by turning thousands of tons of waste in Lahore into liquefied petroleum products and fertilizer for farmlands. 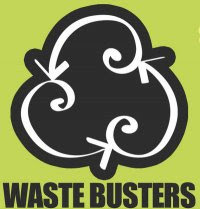 Words like "clean" and "green" are not usually associated with the streets of major South Asian cities, but Farooqui's Waste Busters, a successful waste management business, is slowly changing the image of the Pakistani city of Lahore, according to an Aljazeera report. The business started modestly a few years ago with just six donkey carts and a few workers to collect the trash and manually process it. Today, it has 200 garbage collection vehicles, several waste management plants and employs over 3000 people. Its plants separate garbage in to organics, plastics and metals to produce LPG products, fertilizer, and recyclables for reprocessing and reuse. And it is being done profitably. American corporations created 453,000 jobs in India, a whopping 642% increase in a decade that saw the same corporations cut 846,000 jobs at home. Overall, US multinational corporations added 1.5 million workers to their payrolls in Asia and the Pacific region from 1999 to 2009, and 477,500 workers in Latin America, according to US Commerce Dept data as reported by the Wall Street Journal. 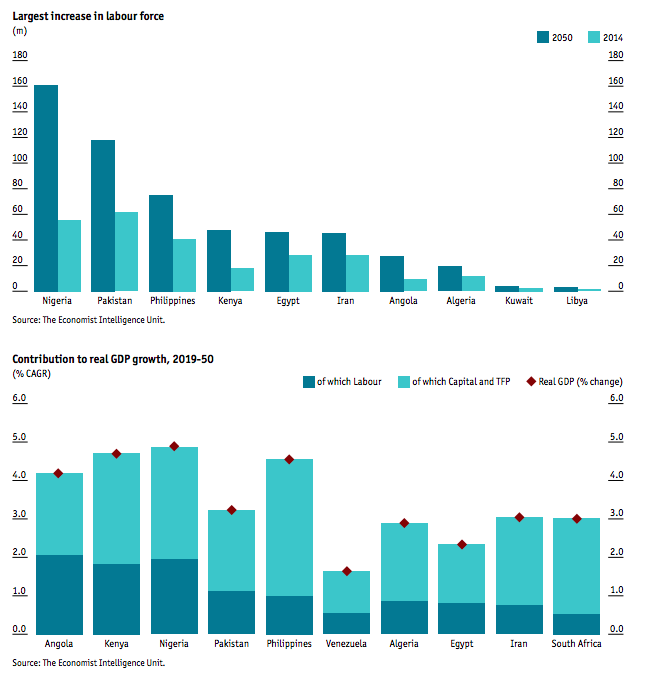 From 1999 to 2009, the multinational companies also reduced capital-investment spending in the U.S. at an annual rate of 0.2% and increased it at a 4.0% annual rate abroad. This occurred in spite of huge Bush era tax cuts for the rich. 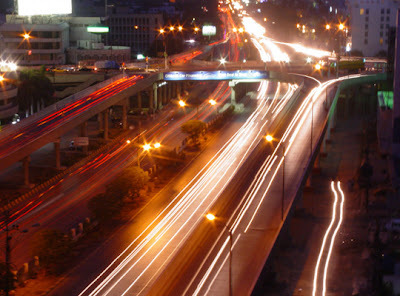 While Pakistan's HDI of 0.504 (2011) ranks it among UNDP's low human development countries, its largest city Karachi's HDI of 0.7885 (2005) is closer to the group of nations given high human development rankings. In a regional human development analysis for Pakistan done by Haroon Jamal and Amir Jahan Khan of the Social Policy and Development Centre (SPDC), Karachi ranks at the top with HDI of 0.7885, followed by Jhelum district's 0.7698 and Haripur's 0.7339. Lahore has HDI score of 0.6882 and Rawalpindi 0.638. Majority of the nations ranked as high human development are less populated than Karachi with its 15 million+ inhabitants, and none is experiencing the massive waves of poor rural migrants from some of the least developed areas of Pakistan which Karachi continues to absorb after each disaster in other parts of the country, natural or otherwise. Simulation software developed by Fulbright scholar Zeeshan Usmani is helping investigators analyze bombings and pursue perpetrators of terror in Pakistan. Usmani is the product of currently the world's biggest Fulbright program being offered in Pakistan, with approximately 200 scholarships for advanced degrees in 2011 alone. 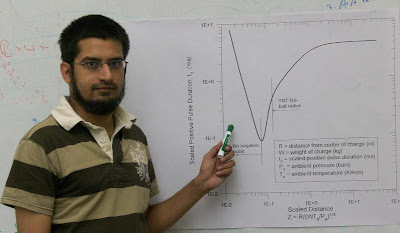 Usmani collaborated with Daniel Kirk at Florida Institute of Technology to develop Usmani-Kirk model for analyzing suicide bomb blasts. The model uses various inputs like before-and-after video footage, bombing debris, chemical residues, victims' injuries, casualty patterns, autopsy data and other available clues about suspects and forensic data to piece together the details of each incident and to help identify the cause and the perpetrators. Pakistan has the world’s sixth largest population, seventh largest diaspora and the ninth largest labor force. With rapidly declining fertility and aging populations in the industrialized world, Pakistan's growing talent pool is likely to play a much bigger role to satisfy global demand for workers in the 21st century and contribute to the well-being of Pakistan as well as other parts of the world. Leading the charge is PTCL (Pakistan Telecommunications Ltd.), Pakistan's state-owned telecommunications company, which recently launched 100 Mbps fiber to the home broadband service using Gigabit Passive Optical Network (GPON) technology. Earlier this year PTCL rolled out bonded VDSL2 technology to deliver 50 Mbps to its existing DSL customers, five times the top speed of the nation's highest level of service at the time, at a construction cost of just $200-300 per home passed.